One of the important endeavours in India to improve the health, well-being, safety and dignity of rural Indians has been the Swachh Bharat Mission (SBM), launched on October 2, 2014 by the Hon’ble Prime Minister of India, Shri Narendra Modi. Swachh Bharat is the largest behaviour change campaign ever attempted in the field of sanitation in the world. It aims to build an ODF (Open Defecation Free) and Swachh Bharat by October 2, 2019 as a tribute to Mahatma Gandhi on his 150th birth anniversary. India is witnessing a sanitation revolution with the number of people in rural India, practicing open defecation having fallen from 55 crores in October 2014 to 25 crores by March 2018. Sanitation has been proven, by various independent studies, to have a positive economic as well as health impact on families in rural India. Under the Swachh Bharat Mission (Gramin), 6.5 crore toilets have been built, 3.38 lakhs villages and338 districts, and 12 States and UTs have already been declared ODF (as on 26th March, 2018). A recent survey conducted by an Independent Verification Agency across 90,000 households in over 6000 villages has found the rural toilet coverage to be 77% and the usage of these toilets to be 93.4%. The progress is accelerating every day and the Mission is on track to achieve an ODF India before October 2nd, 2019. Swachhagrahis: One of the vital components of the initiative are the Swachhagrahis, a community-level army of ‘foot soldiers’ and motivators who implement the Community Approaches to Sanitation (CAS ) at the village level, and are key to driving progress towards achieving an ODF nation. Swachhagrahisare often natural leaders who have been engaged through existing arrangements like the Panchayati Raj Institutions, co-operatives, ASHAs, Anganwadi workers, women groups, community-based organisations, Self-Help Groups, etc. They are usually already working in the GPs and some have volunteered their services specifically for the purpose of sanitation. There are 4.2 lakh Swachhagrahis registered on the ground today. The Mission aims to have one Swachahgrahi in every village, that is, an army of at least 6.5 lakh Swachhagrahis by March 2019. Mahatma Gandhi launched the Champaran Satyagraha over a century ago, on 10th April, 1917, taking several steps to improve the condition of people in Bihar, including basic education, skill development, women empowerment and cleanliness. April 10th, 2018 marks the end of the centenary year celebrations of the Champaran Satyagraha, and is going to be celebrated through the “Satyagraha se Swachhagraha” campaign. 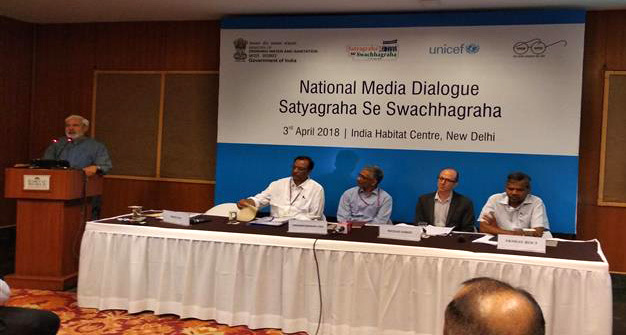 To commemorate this event, Ministry of Drinking Water and Sanitation, in coordination with the Government of Bihar, is working to spread the message of Swachhata across the country by initiating the “Satyagraha se Swachhagraha” Campaign, from 3rd to 10th April. More than 10,000 Swachhagrahis from different parts of the country have been invited to Bihar, where they would be working with 10,000 Swachhagrahis from Bihar to “trigger” behaviour change throughout the 38 districts of the State and build momentum of the jan andolan further. The week will culminate with a mega-event, where the Prime Minister will address 20,000 Swachhagrahisin Champaran District, in the afternoon of 10th April, 2018. As a part of this event, Government of India will also award Swachhagrahis who have performed outstandingly in their villages.